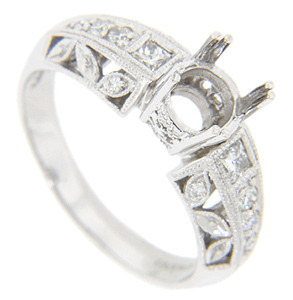 Round diamonds set in leaf shapes decorate the sides of this 14K white gold antique style engagement ring mounting. 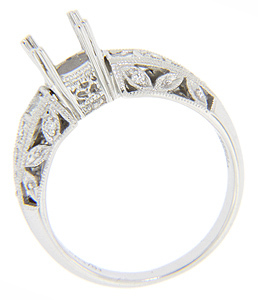 Each shoulder of the ring holds a square diamond with additional graduated round diamonds running down the shoulder. The mounting holds a total of .30 carats of diamonds and measures 7.1mm in width. Size: 7 1/4. We can re-size.